amazing doctor. Took a lot of time to understand my injury. I didnt have to wait all. The staff is friendlyand professional. amazing doctor. Took a lot of time to understand my injury. I didnt have to wait all. The staff is friendly and professional. While the facility and doctor were great - clean, professional, conveniently located close to my job - I have to echothe findings of another reviewer - that this doctor was Out of Network for my Insurance despite being specifically listed as an In-Network provider for me on Zocdoc. When I arrived, there was an insurance specialist who took me to a back room to explain the situation and then proceeded to ask if I was okay with paying the consultation fee for the day and then discussing further if I required treatment. I ended up being seen but it was really inconvenient to take time out of my day and go through all the paperwork only to find out afterwards that the doctor was not in fact in-network. I let the woman know and said they should really look into updating the doctor's profile on ZocDoc because there's no disclaimer easily found and I specifically only searched for providers in my network. I tried calling the office beforehand to confirm but no one answered. Really wish this doctor was advertised correctly! Otherwise it seems like a good facility and knowledgeable doctor. While the facility and doctor were great - clean, professional, conveniently located close to my job - I have to echo the findings of another reviewer - that this doctor wasOut of Network for my Insurance despite being specifically listed as an In-Network provider for me on Zocdoc. When I arrived, there was an insurance specialist who took me to a back room to explain the situation and then proceeded to ask if I was okay with paying the consultation fee for the day and then discussing further if I required treatment. I ended up being seen but it was really inconvenient to take time out of my day and go through all the paperwork only to find out afterwards that the doctor was not in fact in-network. I let the woman know and said they should really look into updating the doctor's profile on ZocDoc because there's no disclaimer easily found and I specifically only searched for providers in my network. I tried calling the office beforehand to confirm but no one answered. Really wish this doctor was advertised correctly! Otherwise it seems like a good facility and knowledgeable doctor. Dr. Kavita Sharma treats all types of pain with a specialty in spine and sports injuries. She uses a multidisciplinary approach to treat her patients with acute and chronic pain. This approach includes both interventional and non-interventional therapies that consider a wide range of treatment options such as medication, physical therapy and procedures. She has treated many patients in private practice in Manhattan and is also a former assistant clinical professor in the departments of Anesthesiology and Family Medicine at Albert Einstein College of Medicine. In addition, she has presented at various conferences such as American Pain Society and North American Neuromodulation Society. She is trained in and has experience with interventional therapies including but not limited to sacroiliac joint injections, interlaminar, transforaminal and caudal epidural steroid injections, intra-articular facet joint injections, peripheral Joint injections, medial branch blocks and radiofrequency ablation. 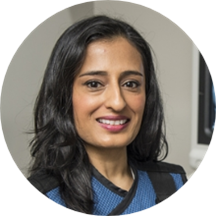 Dr. Sharma completed her interventional Pain Management fellowship at Louisiana State University in New Orleans. She completed her residency in family medicine from The University of Pennsylvania. She is board certified by the American Board of Physical Medicine and Rehabilitation in pain management and by the American Board of Family Medicine. Our office provides the highest quality, individualized, patient centered care. Accordingly Dr Sharma is an out-of-network provider for most insurance plans. A benefits coordinator will gladly speak with you before your fist visit to help check and explain your benefits. Make sure your insurance is accepted, my insurance was not accepted and was an out of network doctor. Definitely would recommend going to Dr Kavita, she took her time to explain and test for where my pain was stemming from. Dr Sharma is awesome. You know from Dr Sharma's demeanor that you are in very capable hands. Excellent diagnostician too. Heidi and the other ladies at the front desk are also great, friendly and all are helpful in this office. I loved my visit with Dr. Sharma! We got right down to the problem and came up with a plan for addressing it. Dr. Sharma was knowledgeable about my medical issues, thorough in her analysis, patient with her explanations, and conservative in her treatment. Dr. Sharma is everything you look for in a doctor: knowledge, articulate, empathetic, and effective. Knowledgeable and patient with my questions. Explains everything, told me what were the options for next step to see which was my best option. Very professional and helpful. Diagnosed problem and gave me referrals for MRI and Physical Therapy. Doctor was awesome. She was concerned with giving the right treatment to fix my back issues. Dr. Sharma is amazing! She was prompt in seeing me, answered all of my endless questions without being too technical, and was very calming during a not-very-pleasant procedure. Dr. Sharma is professional and thorough. She is open and friendly and takes time to answer questions. Although she was pleasant enough and seemed knowledgable, the appointment was rushed and I didn't feel my problem was given the attention it deserved. She basically did a five minute exam then referred me to a PT and X-ray. So overall probably only worth the co-pay for the referrals. Dr. Sharma was great - excellent bedside manner, she explained the procedure clearly and was attentive to how I was feeling during it. Would highly recommend her!